I grew up in Los Angeles, the city by the freeway by the sea. And if there’s one thing I’ve known ever since I could sit up in my car seat, it’s that you should expect to run into traffic at any point of the day. Yes, commute hours are the worst, but I’ve run into dead-stop bumper-to-bumper cars on the 405 at 2 a.m.
As a kid, I used to ask my parents why they couldn’t just build more lanes on the freeway. Maybe transform them all into double-decker highways with cars zooming on the upper and lower levels. Except, as it turns out, that wouldn’t work. Because if there’s anything that traffic engineers have discovered in the last few decades it’s that you can’t build your way out of congestion. It’s the roads themselves that cause traffic. The concept is called induced demand, which is economist-speak for when increasing the supply of something (like roads) makes people want that thing even more. 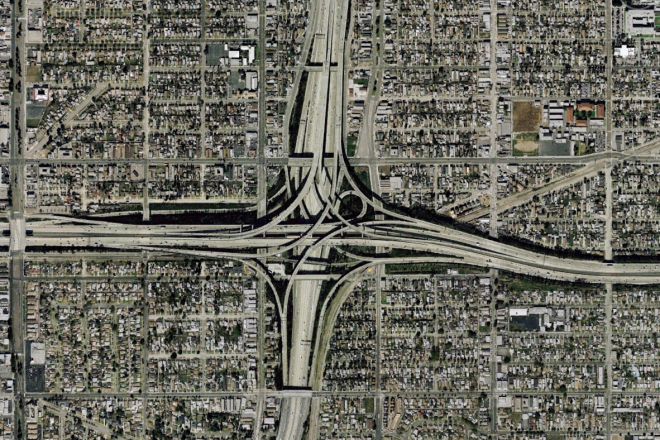 Though some traffic engineers made note of this phenomenon at least as early as the 1960s, it is only in recent years that social scientists have collected enough data to show how this happens pretty much every time we build new roads. These findings imply that the ways we traditionally go about trying to mitigate jams are essentially fruitless, and that we’d all be spending a lot less time in traffic if we could just be a little more rational. But before we get to the solutions, we have to take a closer look at the problem. In 2009, two economists—Matthew Turner of the University of Toronto and Gilles Duranton of the University of Pennsylvania—decided to compare the amount of new roads and highways built in different U.S. cities between 1980 and 2000, and the total number of miles driven in those cities over the same period. “We found that there’s this perfect one-to-one relationship,” said Turner. If a city had increased its road capacity by 10 percent between 1980 and 1990, then the amount of driving in that city went up by 10 percent. If the amount of roads in the same city then went up by 11 percent between 1990 and 2000, the total number of miles driven also went up by 11 percent. It’s like the two figures were moving in perfect lockstep, changing at the same exact rate. Now, correlation doesn’t mean causation. Maybe traffic engineers in U.S. cities happen to know exactly the right amount of roads to build to satisfy driving demand. But Turner and Duranton think that’s unlikely. The modern interstate network mostly follows the plan originally conceived by the federal government in 1947, and it seems incredibly coincidental that road engineers at the time could have successfully predicted driving demand more than half a century in the future. A more likely explanation, Turner and Duranton argue, is what they call the fundamental law of road congestion: New roads will create new drivers, resulting in the intensity of traffic staying the same. Intuitively, I would expect the opposite: that expanding a road network works like replacing a small pipe with a bigger one, allowing the water (or cars) to flow better. Instead, it’s like the larger pipe is drawing more water into itself. The first thing you wonder here is where all these extra drivers are coming from. I mean, are they just popping out of the asphalt as engineers lay down new roads? The answer has to do with what roads allow people to do: move around. As it turns out, we humans love moving around. And if you expand people’s ability to travel, they will do it more, living farther away from where they work and therefore being forced to drive into town. Making driving easier also means that people take more trips in the car than they otherwise would. Finally, businesses that rely on roads will swoop into cities with many of them, bringing trucking and shipments. The problem is that all these things together erode any extra capacity you’ve built into your street network, meaning traffic levels stay pretty much constant. As long as driving on the roads remains easy and cheap, people have an almost unlimited desire to use them. Interestingly, the effect works in reverse, too. Whenever some city proposes taking lanes away from a road, residents scream that they’re going to create a huge traffic snarl. But the data shows that nothing truly terrible happens. The amount of traffic on the road simply readjusts and overall congestion doesn’t really increase. A freeway interchange in Los Angeles. So where did those other drivers go? Many of them switched to public transit, which in Paris has increased by 20 percent in the last two decades. Other trips have simply been avoided, or done on foot. It’s not just Europeans who are eager to get out of their cars. San Francisco removed a highway section, called the Central Freeway, that carried nearly 100,000 cars per day in 1989. The boulevard that replaced it now only carries around 45,000 daily cars and yet they move. (Yes, I’ve been stuck in traffic on Octavia Boulevard, but it’s not like you never get through.) Perhaps the biggest success story has been in Seoul, South Korea, where the city tore down a highway that was considered a vital roadway corridor, carrying 168,000 cars per day. After replacing the cars with a river, parkland, and some smaller roads, traffic didn’t get worse and many other things, including pollution, got better. Now, there’s a limit to all of this. Turn a 10-lane highway into a 1-lane road and you might bring cars to a standstill. Extend that same 10-lane highway to 100 lanes and you might never see traffic again (or your city). While Turner and Duranton have claimed to find a fundamental rule, it’s not exactly like the universal law of gravity. “We can only claim that this is a rule within the range of data we can observe,” said Turner. So what can be done about all this? How could we actually reduce traffic congestion? Turner explained that the way we use roads right now is a bit like the Soviet Union’s method of distributing bread. Under the communist government, goods were given equally to all, with a central authority setting the price for each commodity. Because that price was often far less than what people were willing to pay for that good, comrades would rush to purchase it, forming lines around the block. The U.S. government is also in the business of providing people with a good they really want: roads. And just like the old Soviets, Uncle Sam is giving this commodity away for next to nothing. Is the solution then to privatize all roads? Not unless you’re living in some libertarian fantasyland. What Turner and Duranton (and many others who’d like to see more rational transportation policy) actually advocate is known as congestion pricing. This means raising the price of driving on a road when demand is high. 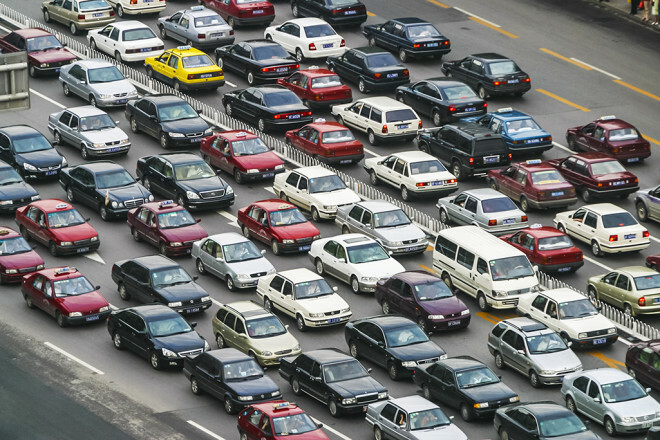 During rush hour, drivers would have to pay a fee to use the most congested roads. A few people will balk at the price and say to themselves, “I don’t really need to make this trip right now, I’ll go later.” Roads in your city actually have a great deal of underused capacity. Think about how they sit mostly empty, in the early afternoon, late evening, and at night. If we gave drivers some extra incentive to avoid the most congested hours, we could better utilize the roads’ capacities. The extra cost of driving would also make public transit a more attractive option, leading to more people using it. Congestion pricing has been tried successfully in places like London, Stockholm, and Singapore. Other cities are starting to look at it as a solution. New York City rejected a plan for congestion pricing in 2008 and San Francisco periodically toys with introducing the idea in downtown. The problem? Voters. Nobody wants to pay for something that was previously free, even if it would be in their best interests to do so. Duranton said that if congestion pricing is a non-starter, a more rational approach to parking could be a good secondary step in easing congestion. Parking in most cities is far cheaper than it should be, and it’s too often free. “Because it’s free, people will misuse it and it will be full all the time,” said Duranton. Drivers searching for parking contribute significantly to road congestion. “There are some estimates that say in the central part of cities up to 30 percent of driving is people just cruising around for parking,” Duranton said. Increasing the price of a parking spot when demand is high would encourage people to leave sooner, letting more drivers occupy the same spot during the day. San Francisco did exactly this starting in 2011 and the results have been a boon to retailers because more customers are able to park in front of their stores. And because prices go down when demand is low, the program has actually saved motorists money. In a move to expand the meters outside of downtown and a few other areas, the city conducted a recent parking census and found that it has more than 440,000 public parking spots, which, if placed end to end, would stretch longer than California’s entire coastline. Try dropping that little factoid during your next cocktail party conversation with city planners and traffic engineers. So remember, the reason you’re stuck in traffic isn’t all these jerks around you who don’t know how to drive; it’s just the road that you’re all driving on.